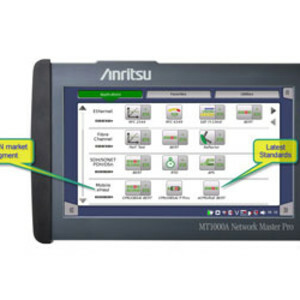 Anritsu enhances its Network Master Pro MT1000A to support 100 Gbps with Ethernet Common Public Radio Interface (eCPRI) and IEEE 1914.3 Radio over Ethernet (RoE), as well as high-accuracy delay measurement functions. With the new firmware installed, the MT1000A can be used by mobile operators, communication network installation companies and communications equipment vendors to efficiently and effectively install and maintain 5G networks carrying eCPRI/RoE traffic. A small handheld tester, the MT1000A is a comprehensive solution that supports all-in-one network evaluations, including eCPRI/RoE/CPRI, Ethernet, OTN, Fibre Channel, SDH/SONET and PDH/DSn. As a result, one MT1000A can perform bit error rate (BER), throughput and latency tests on mixed communications networks based on current optical and digital communications standards. To ensure network high speed and reliability, the MT1000A can also be integrated with the High Performance GPS Disciplined Oscillator MU100090A receiver option with built-in accurate rubidium reference clock. In this configuration, the Network Master Pro supports evaluation of the time synchronisation accuracy for time error measurements. Integrating the MU100090A option, which provides GPS time data, allows the MT1000A to support complementary high-accuracy latency measurements, as well. The MT1000A supports automated testing and Pass/Fail evaluations, eliminating the need for an external controller such as a PC. Operators at any experience level can run network tests, perform Pass/Fail evaluations and create test reports efficiently and easily with the Network Master Pro. With the new firmware update supporting eCPRI/RoE traffic and high-accuracy latency measurements, the Network Master Pro MT1000A is an effective solution for current and future network verification requirements. The compact solution is designed to provide reliable and stable tests on 10 G, 25 G and 100 G metro, access and mobile networks. In addition to supporting RFC2544, Y.1564 and many other network evaluation test standards, it supports Sync-E and IEEE 1588v2 tests. Its flexible configuration that allows test items to be added as custom options helps optimise equipment capital investment efficiency. 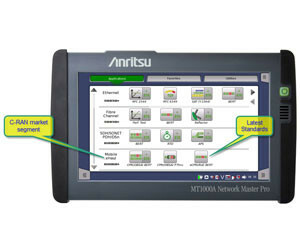 I am interested in Anritsu adds eCPRI and RoE Support to Network Master Pro MT1000A Compact Field Testers .